These are two magazine ads for the Toyota 4Runner. 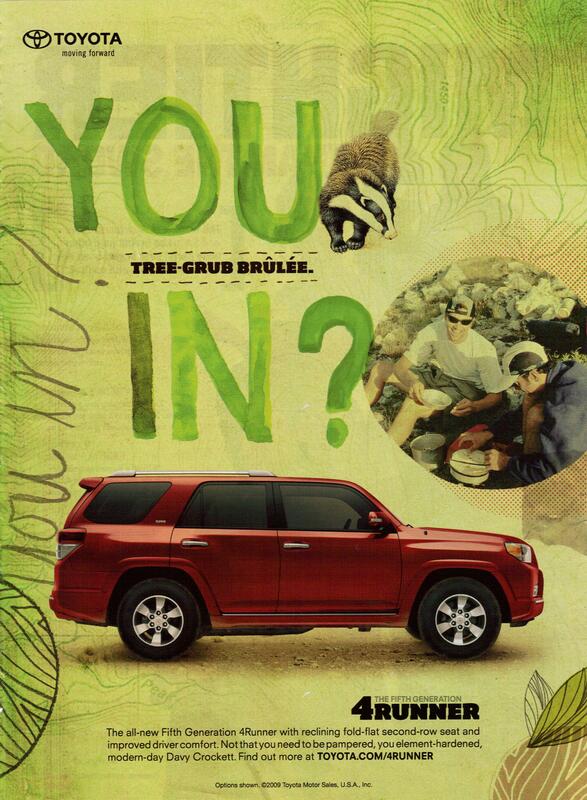 Both of these ads have the same feel – that this car will be great for roughing it on an outdoor adventure. I’m not entirely sure what the car has to do with “tree-grub brulee” and I’m pretty sure it can’t actually time travel back to the Paleozoic era, but you get the idea. The graphic design on these ads is great. The pages feel busy, but actually aren’t that cluttered. There are great details like distressed, browned looking paper (it’s actually the high-gloss pages of a magazine) and a fake torn corner on the second one. The various graphics on each ad are simple, but evoke the camping/outdoors-y feel very well. I have no idea if this car actually is a great camping or exploring vehicle (I always associated Jeeps more with that sort of thing), but the ads do a pretty good job of making the connection between them. They are visually different from not only most other car ads, but most other general magazine ads as well, so they stand out. I doubt that these ads alone would convince someone to buy this vehicle, but they absolutely might get someone to look into it where they otherwise wouldn’t have, and that’s the first step. I actually think these ads work pretty well. I think print ads for this sort of vehicle can be challenging, but this is a great approach. This entry was posted on April 18, 2010 at 12:00 pm	and is filed under Cars. 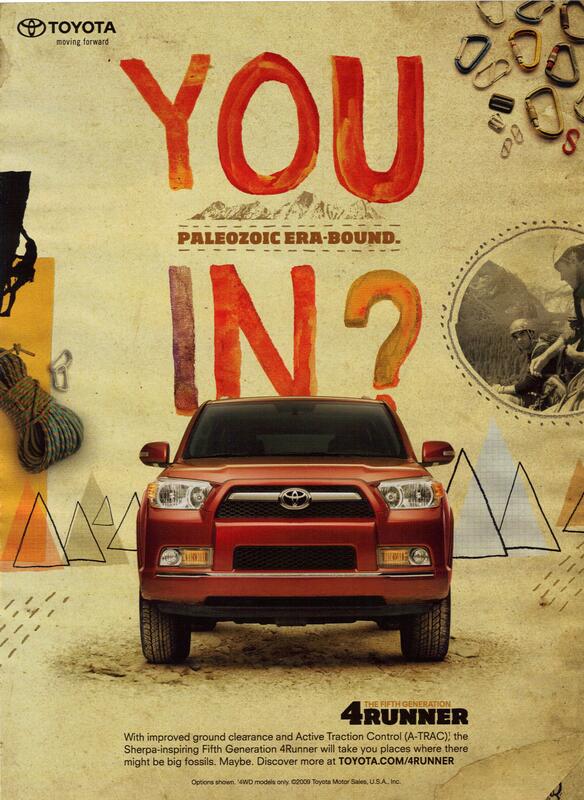 Tagged: 4runner, print-ad, toyota. You can follow any responses to this entry through the RSS 2.0 feed. You can leave a response, or trackback from your own site.